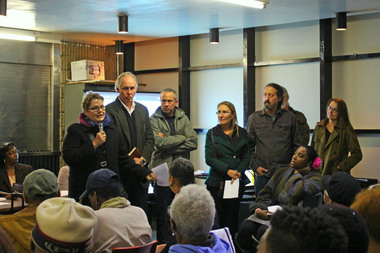 Williamsburg-Greenpoint residents went to community board meetings around the city to convince them to vote against the mayor's zoning proposals. BROOKLYN ­— Greenpoint resident Steve Chesler has spent many evenings lately attending community board meetings across the city. He and other members of North Brooklyn’s Friends of Bushwick Inlet Park are trekking to East New York, the West Village, Flushing and beyond to urge board members to vote against Mayor Bill de Blasio’s proposed zoning changes. De Blasio insists the changes will help the city build 80,000 new units of affordable housing as well as preserve 120,000 affordable units over the next 10 years. Greenpoint and Williamsburg are still waiting for roughly 30 acres of parkland promised them a decade ago as part of the Bloomberg administration’s rezoning of north Brooklyn's waterfront. Chesler's group is sharing that story as a cautionary tale of how rezoning can spur development of pricey glass towers, but promises made to residents for new parks and other amenities go unkept. Led by the Tribeca Trust, a group trying to preserve TriBeCa’s “architectural heritage,” the petition’s signers include a vast range of groups, like the South Midwood Residents Association, the Bedford Stuyvesant Society for Historic Preservation, the Queens Historical Society, the Preservation League of Staten Island, the South Bronx Unite, Women of Woodlawn, Save Harlem Now! and Save Our Seaport. The de Blasio administration’s “Mandatory Inclusionary Housing” program would require some new construction to include permanently affordable housing, and their “Zoning for Quality and Affordability” would eliminate parking requirements and increase building heights, among other changes, with the goal of making it easier to build affordable units and senior housing. Ed Jaworski, president of the Madison-Marine-Homecrest Civic Association in southeast Brooklyn, said his organization started meeting with other civic group leaders from around the city when the mayor’s zoning plan first came to light in the spring. “The unhappiness that you hear in a lot of circles is not just one specific thing, but with the whole process,” Jaworski said. “Instead of going around to community groups, they just started it with real estate folks. The last time local groups connected on such a wide scale was during the 1990s when the Giuliani administration was changing zoning around adult-use establishments, recalled Andrew Berman, of the Greenwich Village Society for Historic Preservation. Groups have lambasted the “one-size fits all” approach of the zoning, insisting that the city’s varied, distinctive neighborhoods have different needs. Many fear the citywide approach will take community input out of the equation, and there is widespread doubt that the planned housing will be truly affordable. Others worry the increased heights and other developer-friendly incentives will encourage tenant harassment and teardowns of existing affordable buildings for narrow towers out of context with the surrounding streetscapes. As community boards vote on the proposals this month, many “no” votes are coming from across the boroughs. In Queens, all but two of the 14 community boards voted against the proposals. Long Island City residents and those in Forest Hills voted “no,” for instance, because of fears of overcrowding. The board in de Blasio’s Park Slope neighborhood voted for it. But at least three others in Brooklyn have voted no, including Bed-Stuy and Sheepshead Bay/Manhattan Beach. So far, three Manhattan boards have voted “no” — the Upper West Side, Harlem and Midtown — while Chelsea/Hell’s Kitchen had a split vote. Staten Island's three boards have delayed their votes at the request of Borough President James Oddo, he said. The zoning changes, he reiterated, were necessary for affordable housing. The administration is also providing a $1 billion development fund for parks, transit and community facilities tied to rezonings, as well as additional legal aid for tenant harassment, officials said. Also, acknowledging that zoning alone can't reach all income levels, officials said the city's Department of Housing Preservation and Development can use special programs to deepen affordability where the need is greatest. Editor's note: An earlier version of this story reported that the Upper West Side's vote was split on the two zoning proposals based upon incorrect information provided by the Department of City Planning. The Upper West Side voted "no" on both proposals. StreetEasy Listings Dip After Fee on Brokers, But Will Renters Pay a Price?